Recorded on June 2, 2014. Black Canary infiltrates a gang of female criminals set to pull a dangerous heist. Rather than be taken in, the gang leader kills herself. 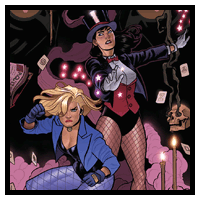 A year later, death stalks the gang, and Canary must turn to her friend Zatanna for help. Listening to this made me really want to open a comic shop. More than I did already.